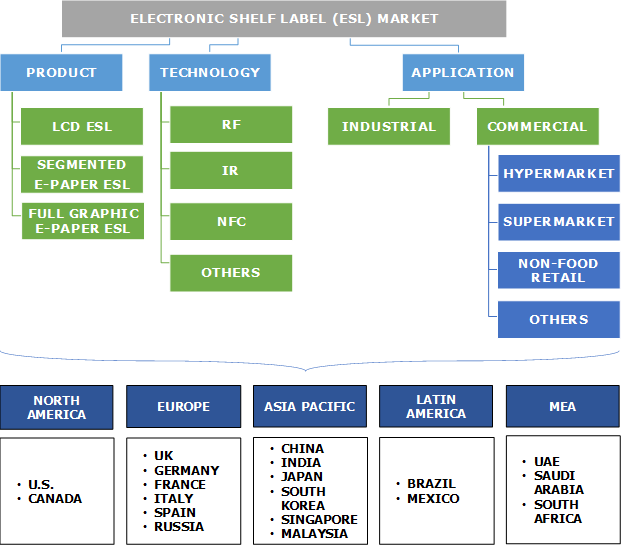 Electronic Shelf Label (ESL) Market size was over USD 450 million in 2017 growing at a CAGR of 13% from 2018 - 2024. The global shipments are expected to surpass 240 million units by 2024. Growing trend of automation in the retail sector is one of the major factors of the electronic shelf label market growth. These price automation solutions offer accuracy and price flexibility at the edge shelf, enabling the retailers to gain a competitive advantage. These labels allow full automation of weekly price change that is considered as one of the most challenging in-store functions. These solutions offer high return on investment and facilitates dynamic product allocation, propelling the demand. The ESL market is expected to gain momentum due to several benefits of these components including low costs pertaining to labor and time saving. These products allow automatic price updating, reducing labor and staff costs considerably. Furthermore, the automation allows reduction in the revenue leakage that results from inaccurate pricing. Moreover, the electronic shelf label market will witness adoption due to the proliferation of IoT technology in the retail sector. The technological advancements in IoT are allowing retailers to provide a real-time and responsive customer experience. 79% of the retailers in North America are investing in IoT technologies such as sensors on shelves and automated inventory verification. The 72% of these retailers are planning to reinvent the supply chain performance by improving visibility using ESL, accelerating the ESL market growth. 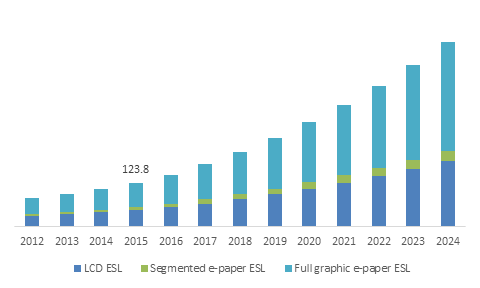 Full graphic e-paper ESL market will witness growth to reach USD 25 million by 2024 due to the low power consumption capabilities with long battery life. These products offer wide viewing angles that make it easier for the customers to easily read the tags on the top and bottom shelves. Furthermore, these components are gaining popularity among the retailers due to their superior optical performance under strong lighting conditions prevalent in the retail stores, t propelling the full graphic e-paper ESL market. LCD electronic shelf label market is expected to account for the majority share as small retailers are adopting these systems due to their low-cost and low maintenance requirements. Also, due to the phasing out trend of large LCD displays, the cost of components is reducing considerably, lowering the overall cost of LCD ESL. The RF ESL label market will grow at a CAGR of around 12% due to the ease of use of these products with Wi-Fi, Zigbee, BLE, and Z-wave. A high degree of security and low cost of these products will drive the adoption of RF-enabled electronic shelf labels. Several manufacturers use the technology as it has multiple layers of security in providing secured low power wireless products. For instance, Altierre developed several products based on patented RF mixed signal chip technology. NFC penetration in the industry is expected to gain momentum over the next six years due to the increasing adoption of NFC technology in multiple devices such as POS systems and smartphones. This allows the retailers to integrate these devices with the existing handheld devices, lowering the overall installation cost of these labels. Industrial electronic shelf label market was estimated to be over USD 90 million in 2017 and it is expected to gain momentum over the forecast timespan due to increased applications of these components in sectors such as inventory tracking and materials management. These products allow the industries to keep track of inventory involved in specific production. The labels are attached to material bin that contains components and allow the operators in production to receive real-time information regarding the movement of materials factory-wide. For instance, Mycronic uses ESL products developed by SES-imagotag to locate the missing materials via factory-wide wireless communication link. Japan ESL market is expected to grow significantly due to the adoption of advanced technologies, such as IoT and checkout-free stores, in the retail sector in the country. The retail sector in Japan is highly competitive and fragmented in nature with many small retail chains and very few dominant retail brands. The retailers are adopting these solutions to make frequent changes in the prices of products allowing the retailers to add promotional offers to attract customers. To satisfy the increasing requirements of the retailers, the manufacturers are developing advanced products. For instance, in January 2018, Japan Display, Inc. announced that the company has developed 30-cm wide high-resolution electronic shelf labels equipped with e-paper technology. The key players in the electronic shelf label market include SES-imagotag, Teraoka Seiko Co., Ltd., Pricer AB, LG Innotek, E Ink Corp., M2Communication, Displaydata, Wincor Nixdorf, CEST, Altierre, and SoluM. The leaders in the industry have adopted different strategies to gain competitive advantages. For instance, Teraoka Seiko offers solutions with digitally coded signals that allow two-way communication with the tags. The products are water-resistant and IP67 certified. Displaydata focuses on the development of graphical three-color labels under Chroma Red and Chroma Yellow product lines. The ESL market is continuously evolving due to the technological adoptions. The increasing number of vendors in the industry has resulted in an increased number of products, thus creating confusion among the consumers, although most of the products are based on E Ink platform. The manufacturers are investing increasingly on differentiation based on design and software. The primary challenge for the digital signage players is the integration of deep networking of these products with the merchandise management systems in the retail sector. Also, the manufacturers are finding potential growth in the designing of ESL products that are larger, more colorful, and consist of multiple graphic forms. The integration of LEDs, light sensors, motion sensors, and intelligent virtual assistants with these components is expected to propel the ESL market growth. Companies, such as NEC and Vitra, are developing intelligent shelving systems that consist of these products, offering a potential for industry growth over the forecast time period.